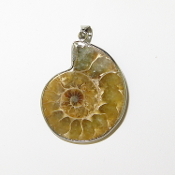 This reversable Ammonite and Sterling Silver pendant measures 3 x 2 inches. This item ships free anywhere in the continental USA. 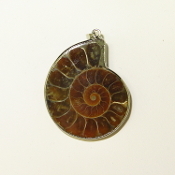 This Ammonite and Sterling Silver pendant is 1 1/2 inches long. This item ships free anywhere in the continental USA. 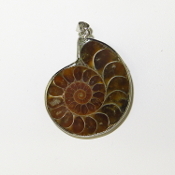 This Ammonite and Sterling Silver pendant is 1 3/8 inches long. This item ships free anywhere in the continental USA. This Fossil Coral and Sterling Silver pendant is about 1 1/2 inch long. This item ships free anywhere in the continental USA. 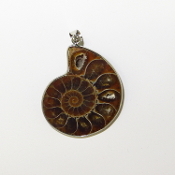 This Fossil Coral and Sterling Silver pendant measures about 1 1/4 inch long. This item ships free anywhere in the continental USA. This Fossil Coral and Sterling Silver pendant is about 1 1/2 inches long. This item ships free anywhere in the continental USA. This Fossil Coral and Sterling Silver pendant is about 1 3/4 inches long. This item ships free anywhere in the continental USA. This Shell and Sterling Silver pendant measures 3 x 1 1/4 inches. This item ships free anywhere in the continental USA.